Catch Exhibit Tech Awards 2016 exclusively on ET NOW on 24th December 2016 at 11 a.m.
23rd December 2016: Exhibit Tech Awards 2016 presented by Reliance Digital and organized by Exhibit Technologies at Westin, Gurgaon was a star-studded event with known Bollywood celebrities and stalwarts of the Technology industry in attendance. 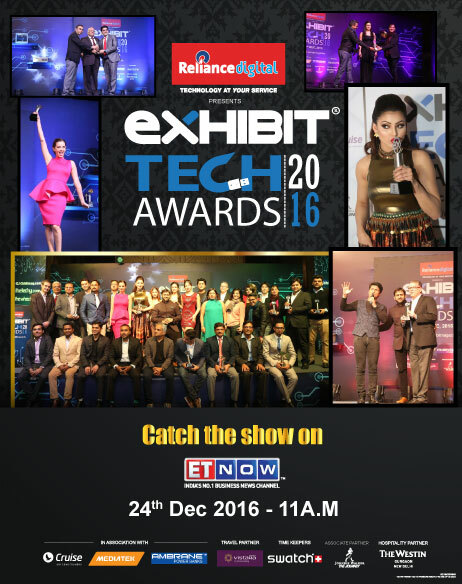 Check out the exclusive glimpse of Exhibit Tech Awards 2016 on ET NOW on 24th December 2016 at 11 AM. The evening was hosted by comedian Sapan Verma from East India Comedy. Exhibit Tech Awards 2016 presented across 26 categories in the tech and gadget segment. Many known faces from Bollywood attended the event including actress Urvashi Rautela, Evelyn Sharma, Natasha Asaddi, Maryam Zakaria, Meera Chopra. Also present at the event were some renowned personalities from the Tech industry like Mahesh Murthy - renowned VC; Brian Bade - CEO Reliance Digital; leading technology show host and blogger - Rajiv Makhni, Mr. Siddhartha Sharma - Editor Technology and Automobiles at Network 18 Digital. Actress Urvashi Rautela won Exhibit Tech Award 2016 for the Most Viral Celeb of the year.